games.net PRESENTS Howard Phillips | media:net berlinbrandenburg e.V. On October 22nd games.net berlinbrandenburg, an initiative of the Medienboard Berlin-Brandenburg GmbH, the Computerspielemuseum and GAME Bundesverband e.V. were proud to present Howard Phillips to Berlin’s game scene. With experience in leading positions at Nintendo, Lucas Arts, THQ and Microsoft Game Studios Howard Phillips possesses comprehensive expertise in mobile and console game design and development. He has designed and/or produced over 165 games, winning two times the “Game of the year” award, and evaluated over 1,000 game productions. Now Howard Phillips is working on a range of new social and mobile games as Head of Game Design and User Experience at GameDuell, a major cross-platform games developer headquartered in Berlin. Howard Phillips first visit of the Computerspielemuseum began by a tour with the director himself, Andreas Lange. After the official start of the evening with a welcome by Andrea Peters (media.net berlinbrandenburg) and Thorsten Unger (GAME Bundesverband e.V. ), Andreas Lange (Computerspielemuseum) introduced Howard Phillips to the guests and handed the microphone over to him. In his presentation at the Computerspielemuseum Howard Phillips told the history of digital games development from the eighties to today in his own very personal perspective. 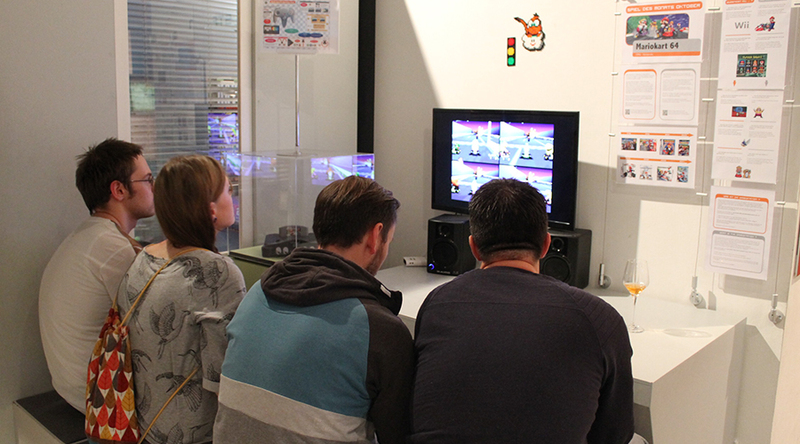 He particularly focused on the changes in use patterns and game controls, ranging from Arcade single screen 2D games such as Radar Scope, Donkey Kong, and Punch-Out! !, over console and handheld games like Super Mario Bros, Metroid, The Legend of Zelda and Tetris of the Nintendo era to PC Games, graphic adventures and flight sims of his time at Lucas Arts. Passing the evolution from 16-bit over 32-bit to the CD-ROM product business and the emergence of LAN parties, he ultimately talked about the downloadable and mobile games of our time. Interestingly many classic design patterns re-emerge in current games such as compulsion loops, skill and knowledge progression, complexity and immersion, social gaming as an extension of single player experiences as well as playing anytime, anywhere. Based on these conclusions Howard Phillips wrapped up his talk with the major lesson he learned in 34 years of game production and that is to give the players control over their gameplay. Around 60 guests had the opportunity to discuss the history of games and questions about the future of game development with Howard Phillips, while enjoying the buffet, drinks as well as the permanent exhibition of the Computerspielemuseum exclusively opened for this event. The Computerspielemuseum closed the official part of the evening by adding a portrait of Howard Phillips to their Wall of Fame. Special thanks to Howard Phillips, the whole team of GameDuell and our games.net Partners as well as the Partner of this event, who enabled this inspiring evening: the Computerspielemuseum, GAME Bundesverband e.V. and Gamesmarkt.